Home » Can A Teen Operate A Boat Without An Adult? Can A Teen Operate A Boat Without An Adult? Boating safety became a national discussion after two Florida teens, Perry Cohen and Austin Stephanos, disappeared off the Jupiter Inlet in 2015. As of 2018, their families still wonder what really happened during the teens’ supervision-free sea session. Unfortunately, they may never know. This unexplained tragedy highlights the need for boating safety and raises an important question: Can a teen operate a boat alone? Age requirements vary by location, but in most states, a teen can operate a boat without adult assistance. Many states, including Illinois and Massachusetts, trust kids as young as 12 on the water as long as those kids complete a boating education course first. Alaska, Wyoming, and South Dakota are even more lenient; these states do not require a boating education course at any age. In some states, the type of boat impacts age requirements. For example, teens may have the option to operate personal watercraft without an adult but may require supervision on a motorboat. Horsepower also affects age restrictions. In Arizona, a child under 12 cannot operate any vessel, even personal watercraft, if its motor exceeds eight horsepower. In Minnesota, teens must become certified prior to operating vessels with motors that exceed 25 horsepower. As a parent or guardian, you may already know that just because a teen can legally operate a boat alone does not mean a teen should legally operate a boat alone. 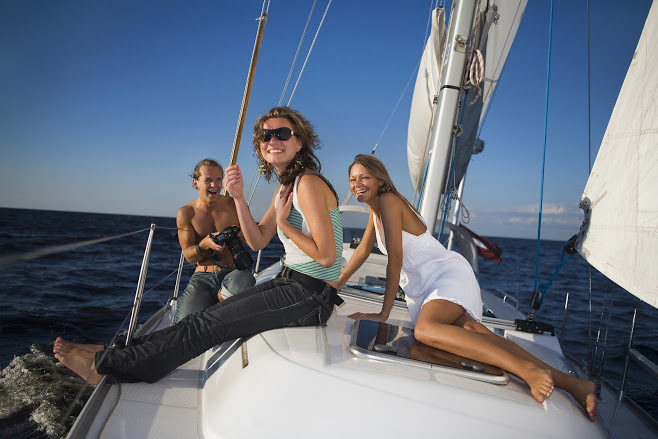 Think of a boat as an automobile when deciding whether to let your teen operate a boat without adult supervision. An untrained teen can crash into other watercraft or large rocks as well as struggle to steer the boat the correct way. This may cause the boat to capsize or send your teen floating into unknown waters. This is not an all-inclusive list of teen preparedness for boating, but it will help you identify strengths and areas of concerns as your child navigates the water. As we mentioned earlier, some states require boating education courses. These are generally not one-time training sessions; many boating education courses involve approximately 6 to 13 lessons. It’s not a bad idea to enroll your teen in one of these courses, even if your state doesn’t require formal training. Regardless of whether your teen takes a boating education course or prefers to learn the ropes from you, it’s essential that they understand how to stay safe while operating watercraft. Safety gear is mandatory, so make sure your teen wears a life jacket at all times. Your teen should also keep extra safety gear, such as a life preserver or other flotation device, on deck. If an emergency occurs, does your teen know how to request help? A marine radio may help your teen contact helpful agencies during emergencies, especially if cell phone service is unavailable. He should also keep flares on hand to attract attention if radio and phone attempts fail. Boating is an activity your family can enjoy together, but as children get older, they may want to occasionally explore local waters alone. Protect your teen by trying the tips above, and reach out to Petzold’s Marine Center for additional suggestions regarding must-have supplies for young boaters.